It's name was probably derived from Katpatuka, land of the beautiful horses, in Hittite language. Cappadocia is generally regarded as the plains and the mountainous region of eastern central Anatolia around the upper and middle reaches of the river Kizilirmak (Red River). It was here that several ancient highways crossed and different cultures came into contact with each other. It was also the land of the Hittites. 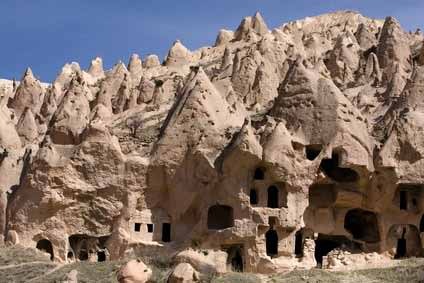 The sparsely inhabited landscape of Cappadocia is characterized by red sandstone and salt deposits of the Miocene (Tertiary) period. Cappadocia is not a town or city, it is not even one of the current seventy-three provinces of the Republic of Turkey. Instead it is a loosely defined area that continues the name of an ancient Roman province and boasts a history that is as complex as its landscape. The topography, curious as it is, is easier to explain than is the history. Behind Kayseri is Mount Erciyes, an extinct volcano. Thirty million years ago it wasn't extinct by any means, producing immense quantifies of ash that, over the millennia, turned into soft rock, called tufa, covering some 1500 square miles of central Anatolia. Volcanos don't always spew out the same sort of stuff and so it was with Mt. Ercicyes. Some time after it had laid down the thick layer of tufa it produced lava that hardened into very much harder stone. When the volcano finally called it quits, water and wind took over and began to erode away the tufa. Great amounts of it were literally blown away but where it was held down by the heavy stone above, it stayed in place. 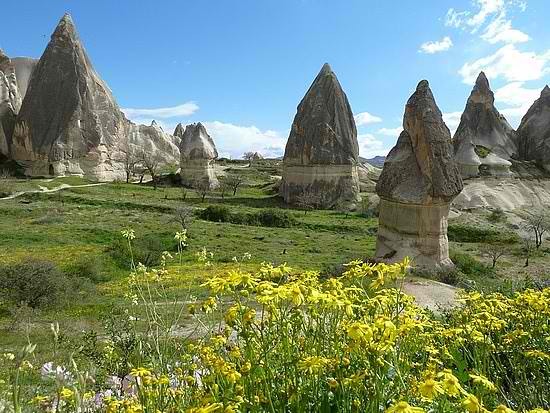 One of the results is what today's romantics called "fairy chimneys," remembering folk tales about people being carried off by fairies when they strayed too far into what was a volcanic wasteland.